Choosing where to stay in San Francisco can be difficult. With so many neighborhoods to choose from, selecting accommodation can be overwhelming for the first time visitor. Local writer Mimi McFadden created this guide to help you with your decision. 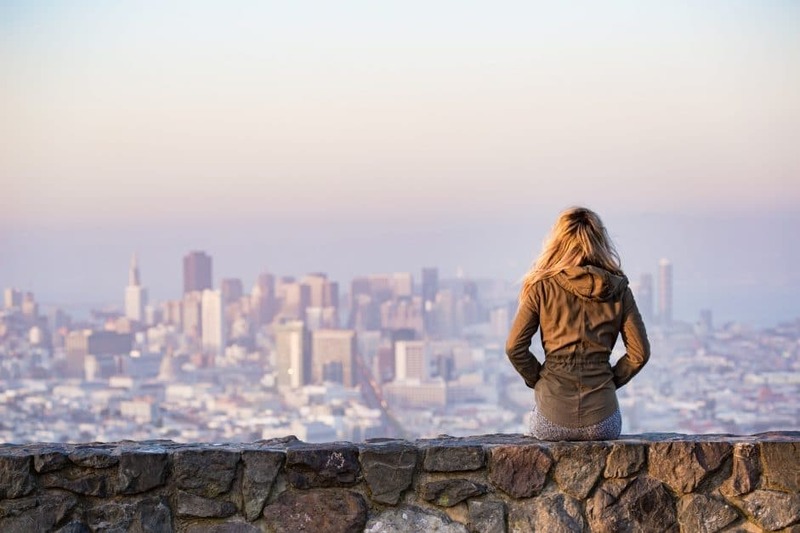 A guide to San Francisco includes information on of the 5 most popular areas with suggestions of where to stay, what not to miss and insider tips. There are affiliate links in the post where theplanetd will earn a commission if you make a purchase but there is no extra cost to you! San Francisco was once known as the epicenter of the counterculture movement. In the 1960s and 70s, it was the place where you would find artists, beatniks, and those who practiced an alternative lifestyle. It was where the likes of Jack Kerouac, Allen Ginsberg, and Janice Joplin lived and thrived creatively. Life back then was about experimentation. It’s where the hippie movement was born and where it took off in America. Nowadays, the city is more tech than it is artsy, but I’d argue that you can still find the many sides of the city that make it such a memorable place, depending on where you go. And regardless of how the city has evolved in the last 50 years, it still revolves around a culture that values tolerance and acceptance of diversity. It’s one of the aspects I love most about the city, its openness and forward-thinking thought. 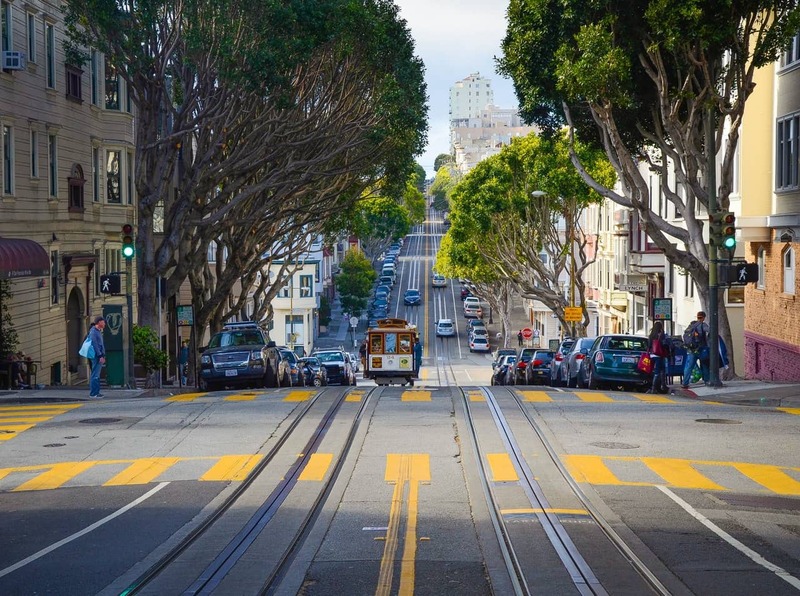 At about 49 square miles, San Francisco is a compact city that is walkable - if you can manage the hilly terrain, bubbling with numerous districts, cultures, and good eats. Don’t let its size fool you, however. Even those who have lived there for years haven’t scratched the surface of everything there is to experience in this dynamic city. From vintage and beatnik poetry shops to world-renowned museums, funky art galleries, high-rise condos, famous live music venues, and Michelin-starred restaurants - San Francisco has everything your heart could desire. If you’re not careful, you might just leave it there someday. Where to stay in San Francisco - a few key neighborhoods in the city. San Francisco may be walkable and compact, but the atmosphere of the different districts are like night and day. Depending on what kind of trip you want from the city, it can matter where you stay. If you want to skip directly to any of the neighbourhoods in San Francisco, click on the links below. The Mission - trendy area that's known for hipster cafes and shops, but also traditional taquerias and Mexican grocery stores. A melting pot of cultures. As I mentioned above, the city is fairly walkable and easy to navigate. The local transportation is widespread and runs often, and you have plenty of options from the local Muni buses, to the BART, and trolley/streetcars. Passes can be bought either on the trolley and bus, or at any BART station. Bus tickets start at $2.50, a single cable car ticket costs $7, and BART tickets depend on the distance you're traveling. If you're going to be in the city for multiple days, consider getting a Clipper card: this transportation card can get you on the majority of transport in the city, and you can easily put funds on at most BART or Muni stations. You can also find locations to buy a Clipper card and load funds on from this website. Clipper cards can be used throughout the Bay Area, so they are useful if you want to take a day trip to Sonoma, San Jose, the East Bay, or another spot in the Bay. Bus tickets have a 1.5 hour window: so if you need to make 1 or 2 transfers to get to where you're going, you can use the same bus ticket (if it's within the time frame) without having to buy another ticket. San Francisco Airport Transfer to Downtown San Francisco for $17: Save time and money, and avoid the long line for a cab at San Francisco Airport. This hassle-free transfer provides efficient, comfortable, and safe service to your downtown hotel in San Francisco. Grab a City Pass to save up to 40% on local attractions! 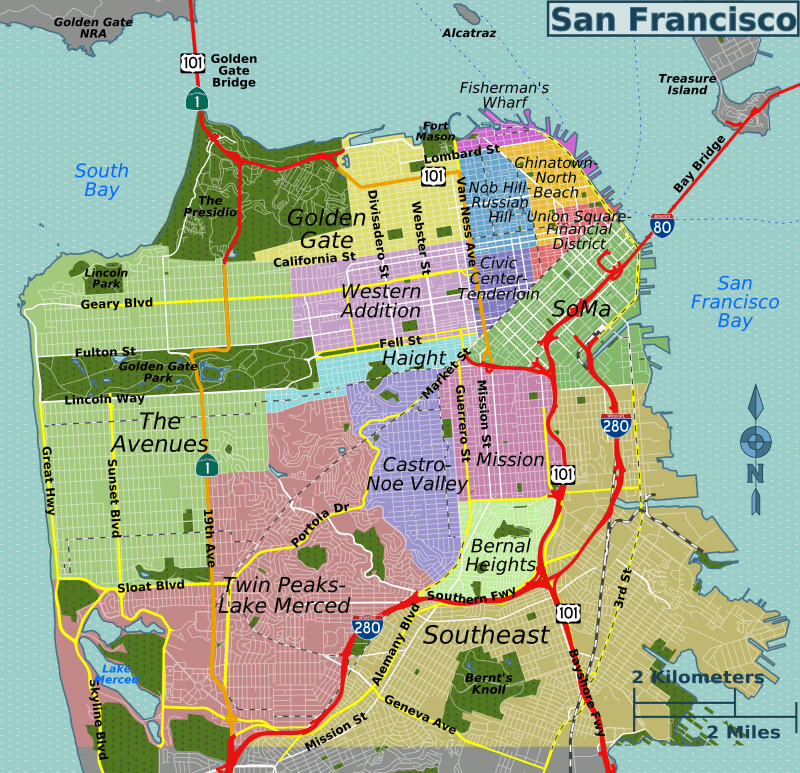 The amount of districts that San Francisco has is often disputed, but the city is thought to have at least 27 distinct neighbourhoods. Each of them has their own unique personality and draws, so when looking for the best places to stay in San Francisco I'd recommend trying to see as many as you can to get a feel for the many sides of the city. back to top - return to top of page for the full list where to stay in San Francisco by districts. Even though it's in California, San Francisco can be cold (including summer), because of its fog layer and strong sea breeze. Dress in layers and always make sure you have a sweater or light jacket for the evenings. See my 12 things to do in San Francisco for ideas of what to do around the city. The Ultimate San Francisco Photography Guide- A perfect visual planner for in and around San Francisco. Eagle Creek Plug Adapter - This all in one adapter is all you need for San Francisco and other North American and world travels. If you are looking for tourist central, fog, clam chowder, and history this is the place for you. Crowds, bustling streets, and a salty sea breeze that makes your hair stand-up like a member of The Flock of Seagulls. This is Fisherman’s Wharf, potentially the most touristy area of San Francisco, but also the perfect place to be based if you have a short time in the city and want to cross off a lot of things in a few days. It’s also an ideal location if you’re traveling with kids. There is a reason this is one of the best places to stay in San Francisco. 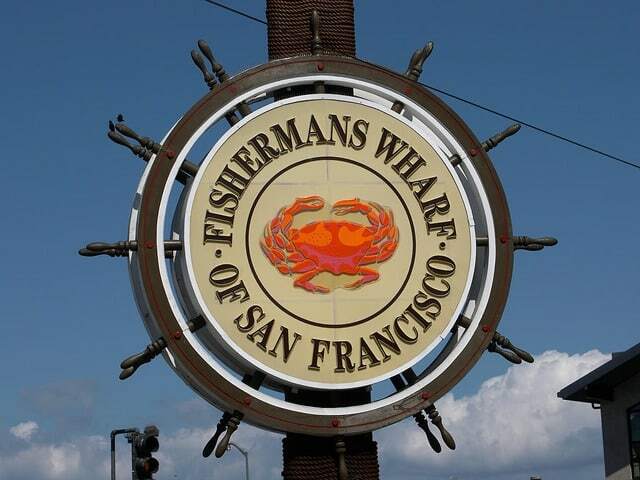 At Fisherman’s Wharf you’ll find the famous San Francisco clam chowder, tickets for Alcatraz, and tourist experiences like Madame Tussauds Wax Museum, and The San Francisco Dungeon. Fisherman’s Wharf is what you might imagine San Francisco to be like in your daydreams - near the bayside, historic and colorful buildings, and a brisk wind that sometimes makes you forget you’re still in California. For first time visitors to San Francisco and familie,s this is a great choice for the iconic landmarks and attractions. 4-star hotel, good views, historic, luxury. Next to the SF Maritime National Historic Park. Close to the beach, eco-friendly, new and modern, with a fitness center. Great location. Boutique, nautical-themed rooms, central, near Pier 39, Lombard Street, and Ghirardelli Square. Clam Chowder - try the famous clam chowder in a sourdough bread bowl (and watch the sourdough bread making demo) at Boudin Bakery. Street performers - take in the painted street performers that line the sidewalks. Pier 39 - the hub of Fisherman’s Wharf where you’ll find many tourist attractions and restaurants, and the lazy sea lions chilling out around back. 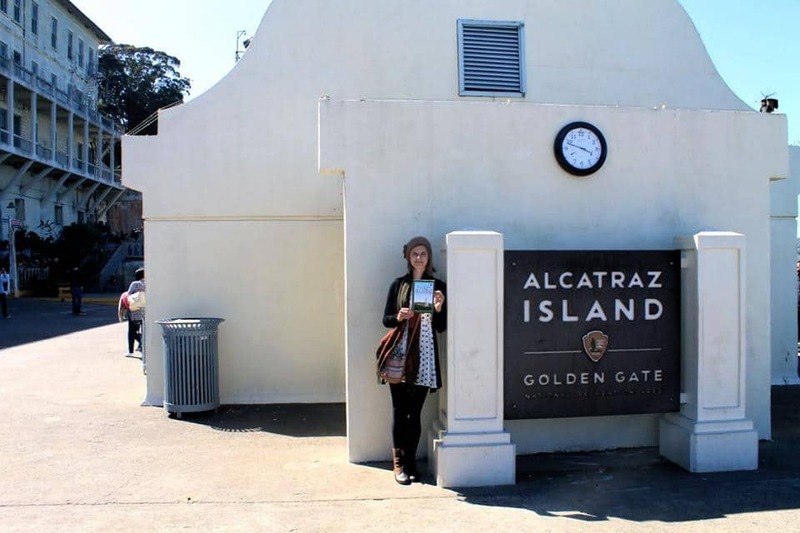 Alcatraz - take a day trip to Alcatraz via ferry, or one of the other nearby islands, including Angel Island or Sausalito. San Francisco City Pass - if you want to combine bus & cable car passes with the top attractions in the area, get a San Francisco City Pass for $89. It saves time and offers valuable discounts. SF Bay Cruise Adventure & Escape from the Rock boat tours - allowing you to take in the best of those harbour views and the history around its waters. 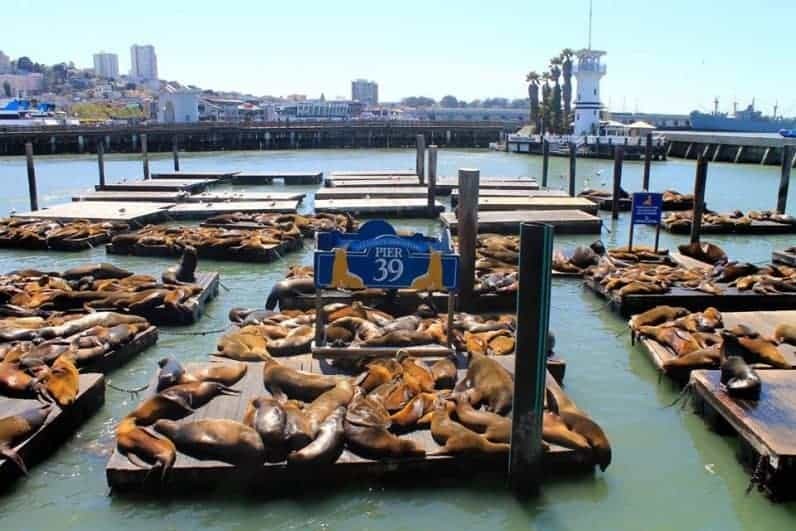 San Francisco hop-on-hop-off tours - if you have a short amount of time in the city and want to see a lot in 1-2 days, these tours can be a good option. Fisherman's Wharf, A Hidden History - free walking tour sponsored by the public library, great for getting a local's guide to the neighbourhood's history without breaking the bank. Take the E or F-Line streetcars (get off at Pier 39). You can also take Muni Bus 8 (get off at Powell St. & North Point St.), or 30, 91 (get off at Columbus Ave & North Point St.). For more information check out the San Francisco Muni website for updated costs and schedule. The San Francisco City Pass gives you unlimited travel on Muni buses, trolleys, and cable cars for three days. If you're looking for shopping, a central location, nightlife, good restaurants, and being in the middle of all the action, Union Square is a good location for you. Want to be completely immersed in the throbbing heart of the city? Then staying in Union Square is a must. You’ll be surrounded by skyscrapers, locals and tourists alike, glitzy storefronts, and good eats for all budgets. It’s the most convenient location for getting around the city, either by foot or public transit. This is the place to shop until you drop and also where you’ll find some of the highest rated restaurants. This is where you’ll find a city that never sleeps. Historic building, funky interior design, great ambiance, in-room spa services, pet-friendly. Centrally located and inspired by 1920s & 30s art and literature. Filled with antiques this is a very cozy hotel. Cable Car - ride the iconic San Francisco cable car - leaving from Powell Street. Shopping - window shop around all of the high-class designer stores in Union Square. Theater - San Francisco has one of the best art scenes in the world, especially when it comes to the theater. Don’t miss out on a show at one of the stunning theaters not too far away from Union Square - Shelton Theater, San Francisco Playhouse, or the Orpheum. Museums - Some of the best museums of the city are located near Union Square, including the Contemporary Jewish Museum, Museum of African Diaspora, SF MOMA, and the California Historical Society. Magic Bus San Francisco - a unique and totally San Francisco-themed tour around the city to show you its diverse past and present. A traveling movie theater, light show, and rocket ship. 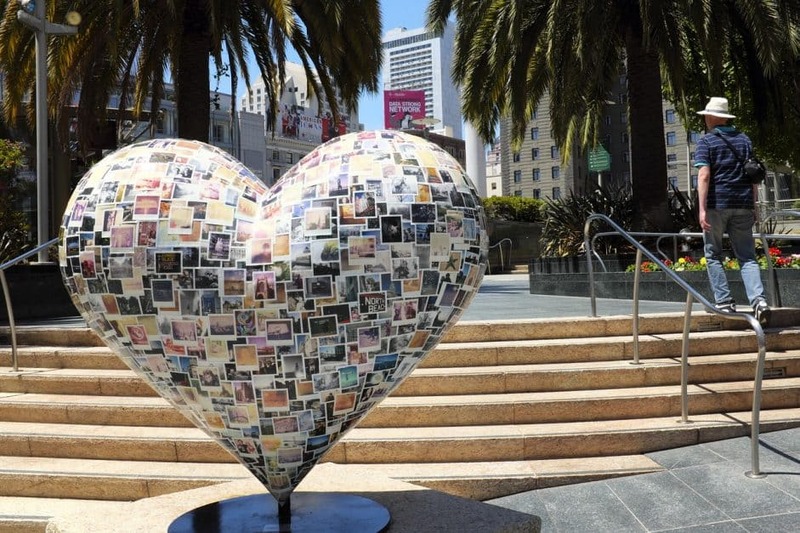 Free SF Tour - free walking tour starting from Union Square at 10am every day. 2.5 hours and many fun facts involved. The Painted Ladies - San Francisco City Tour - a fun and groovy tour that takes you around the city in an old school VW transporter bus. Emperor Norton’s Fantastic San Francisco Time Machine - if you're looking for character, this tour has a lot of it. A walking tour that is as lively as it is informative. Your guide is Emperor Norton I, Emperor of the United States and Protector of Mexico. Haunted SF - Take a walk on the ghostly side and explore San Francisco's creepier past. Most public transport in the city goes near Union Square. You can take the BART (get off at Powell St). And numerous Muni buses (including the 5, 5R, 6, 7, 7R, 8, 8BX, 9, 21, 30, 31, and 38). Additionally, the K, L-Owl, M-Owl, N-Owl, and T-Owl Muni Metro lines all go near Union Square as well (get off at Market & 4th/Stockton). If you're looking for counterculture history, alternative vibes, vintage shops, and a place where hippies and punks live side by side, this is the neighbourhood for you. One of the most beloved neighborhoods in the city for its historical significance and decade-defying charm. This was the center of the summer of love in San Francisco in 1967. It’s where the hippie movement in California took form. 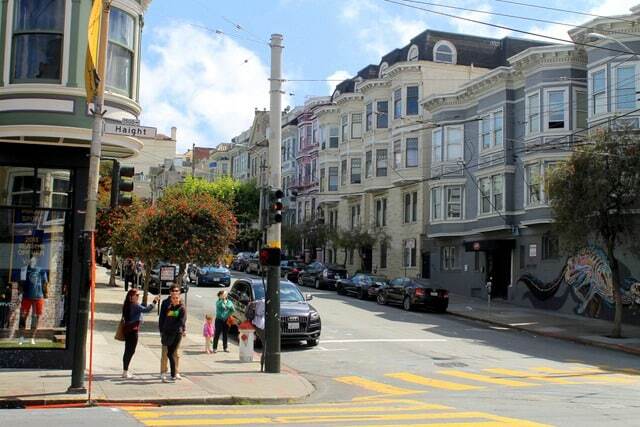 You might find more hipsters than hippies here today, but Haight-Ashbury is still one of the most interesting places to visit in San Francisco. This is where vintage and nostalgic shops, record stores, tattoo parlors, colorful streets, and a wide-range of quirky restaurants and cafes come together to form a funky combination of old and new. It’s also where you’ll find a more local side to the city than what you might see in Fisherman’s Wharf or Union Square. Free breakfast, Victorian-style rooms, kitchen facilities, wine & cheese hour & tea service, near Golden Gate Park. Historic, themed rooms, with antique electric fireplaces, and only two blocks form Golden Gate Park. Amoeba Music - it’s the largest independent music store in the world and they host regular monthly events. Golden Gate Park - where all the hippies have gone, don’t be surprised if you see drum circles and smell a joint or two as you walk through its leafy grounds. This is where The Grateful Dead, Janis Joplin, and Jefferson Airplane used to play impromptu concerts. Vintage Shops/Record Stores - go shopping at the many unique vintage shops or spend a day leafing through old records, it’s kind of a favorite pastime in the Haight. Buena Vista Park - it takes about 30-40 minutes to hike to the top of the hill, but it’ll be worth it for the impressive views of the city. Victorian Architecture - admire the colorful Victorian homes that pop against the already colorful streets. There is actually the highest concentration of Victorian homes here than anywhere else in the city, because the Haight was one of the few areas that wasn’t damaged by the 1906 earthquake and fire. The Famous Legs (at Piedmont Boutique) - an iconic landmark in Haight-Ashbury, fun for pictures. Haunted Haight - Everything you'd ever want to know about San Francscio's macabre history, local ghost folklore, and ghost hunting in the Haight. Haight Ashbury Overview - free walking tour sponsored by the public library to get a good overview of the Haight and its layered history. Haight-Ashbury Flower Power Tour - a backstage pass to the coolness of the Haight. Touches on cosmic history, rock'n roll, art, fashion, and architecture in the neighborhood throughout the years. The Free Love Tour - a guitar-toting tour guide that takes you through the Haight, and talks about how the 1960s and the Summer of Love forever changed San Francisco. Take the Muni bus 6, 7, 37, 43 (get off at Haight St & Masonic Ave) or 33 (get off at Ashbury St & Haight St). If you're looking for boutique shops, family-run delis, and Italian culture, this is the neighborhood for you. This is my favorite neighbourhood in San Francisco for its delicious food, great bars and cafes, and its local feel. North Beach has a little bit of everything that makes San Francisco so special - good food, great views, and ideal people watching. During the day there are countless cute cafes to spend the afternoon in, the perfect picnic spot at Washington Square Park, and independent bookstores to peruse. At night, the sultry bars and clubs pick up for a wide range of patrons, some call it seedy or bro central at times, but it just adds to the diverse and intriguing nature of the district. 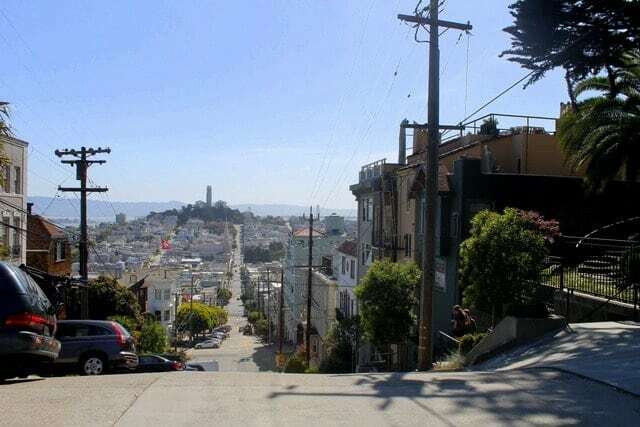 North Beach isn't too far from the famous Telegraph Hill and Lombard Street - the crookedest street in the world. It's also the perfect base for exploring Coit Tower, soaking up grand city views, and even exploring Chinatown. Boutique hotel in the heart of North Beach, free breakfast, great views. Bohemian-inspired decor from the 50s and 60s, steps away from many cafes and jazz clubs, near Lombard street. Quirky, European-stye hotel, 10 min walk to beach, pedestal sinks, furnished with Victorian heirlooms. Coit Tower/Telegraph Hill - a hike up one of San Francisco's classic steep hills will bring you to Coit Tower, where you'll find some of the most breathtaking views of the city and bay. Inside the tower are murals that were funded by the WPA and tell a visual history of the city. Filbert Steps - great views and lush gardens to walk around, if you keep an eye out you might just see the flock of green parrots that made Telegraph Hill so famous. Washington Square Park - one of the first parks built in San Francisco. Great place to picnic, relax, people watch, and take in the views of Coit Tower. It's also right next to the picturesque Saint Peter & Paul’s Church, where Marilyn Monroe and Joe DiMaggio posed for their wedding photographs. 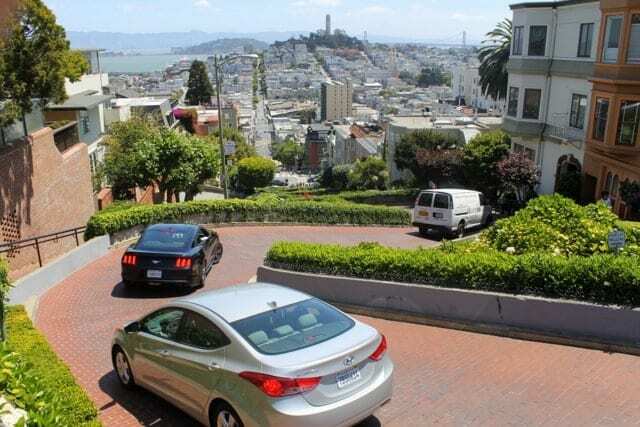 Lombard Street - just a short walk from the heart of North Beach, Lombard street is a fun one to drive down or walk around. It's called 'the crookedest street in the world' for a reason. City Lights Bookstore - a literary landmark and iconic beat poetry store. Probably the most famous bookstore in the city, the perfect place to get lost in a love for books. Beat Museum - Along the same vein as City Lights is the Beat Museum, where you can learn more about the beatnik culture that took over San Francisco in the 1950s and 60s. North Beach Museum - free museum that tells the intriguing history and culture of North Beach. Coit Tower Murals, North Beach Overview, North Beach By Night - free walking tours sponsored by the public library, a great way to spend your time learning more about the North Beach district. Foodie Adventures - North Beach-Chinatown Combo Tour - If you love food, you will love this tour. San Francisco is one of the premier foodie capitals in North America, discover some good eats in North Beach and Chinatown. Additionally, you can take the Powell/Mason cable car (get off at Columbus Ave & Chestnut St). If you're looking for trendy hipster cafes and shops, as well as the best Mexican food and locally-run grocery stores, this is the neighborhood for you. The smells of freshly roasted coffee and Mexican food waft together alongside the sights of colorful murals and local grocery stores as you walk down Mission or Valencia St. The Mission is a huge district that’s heavily influenced by hispanic culture, it was actually named after a Spanish-era mission, Mission San Francisco de Asis. It’s the place where you’ll find trendy bars, cafes, and boutique shops, but also local Mexican grocery stores and traditional taquerias. The Mission is an eclectic mix of old and new and a diverse melting pot of cultures. You'll also get your kitschy tourist items in this area and plenty of cheap drinks. The charm of this area is just getting lost in the streets. Dolores Park - Where people go out to enjoy the nice weather and picnic. Great views of downtown and an even better atmosphere. Mission Dolores - Founded in 1776, Mission Dolores is the oldest surviving structure in San Francisco, making it through the 1906 and 1989 earthquakes. Divine intervention? Maybe. Mexican Food - Trying a ‘Mission Burrito’ and the best Mexican food in San Francisco. Some fan favorites include La Taqueria, Taqueria Cancun, and Pancho Villa Taqueria. Murals - You can find murals all over San Francisco (over 1,000 in fact), but the ones in The Mission are something special, with some that have been there since the 1970s. The highest concentration of street art can be found on Balmy Street and Clarion Alley, but it’s worth spending the day walking around the neighborhood to spot the hidden ones along the way. Roxie Theatre - San Francisco’s oldest theater, you can still catch up-and-coming documentaries, classic films, and cult horror films here. Mission Murals, Mission Dolores Neighborhood - free walking tours sponsored by the public library that give you a good overview of The Mission. 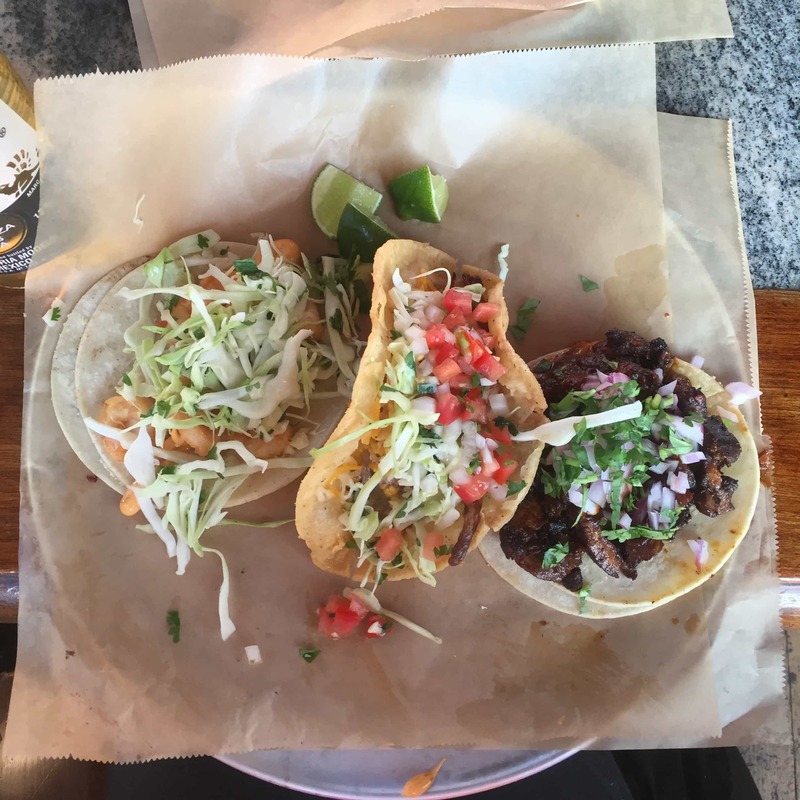 Foodie Adventures - Mission District Tour - if you love everything from authentic Mexican food to trendy award-winning restaurants, this tour is for you (and your stomach). The Radical SF Tour - get to know more about the social movements that have shaped San Francisco, and which took shape in The Mission and Castro districts. Take Muni bus 14, 14R, or 22 (get off at 16th St. & Mission St). You can also take the BART (get off at Mission Station/16th St or 24th St). As you can see, there are many unique experiences to have in San Francisco. It's the perfect weekend (or week-long) trip that offers culture, quirkiness, and those California vibes in a condensed 49-square-mile package. It's a city that has grand views, various nightlife options, and tourist attractions, but also one that is bursting with green parks and hiking trails not too far from its busy streets. San Francisco is hard to forget, even long after you've packed your bags for home. Its versatile character is truly one-of-kind. So, bundle up in your favorite scarf to cut out the wind, thumb through that book of beat poetry, and get ready to eat the best clam chowder of your life. Enjoy your trip to San Francisco, and be sure to wear some flowers in your hair. Mimi McFadden is a travel blogger and freelance writer. Originally from California, she has been slow traveling the world since 2013. When she’s not writing, she’s probably sipping on a pint of craft beer, chasing waterfalls, or planning her next crazy adventure in a foreign land. You can find her on Instagram, Facebook, and her blog, The Atlas Heart. 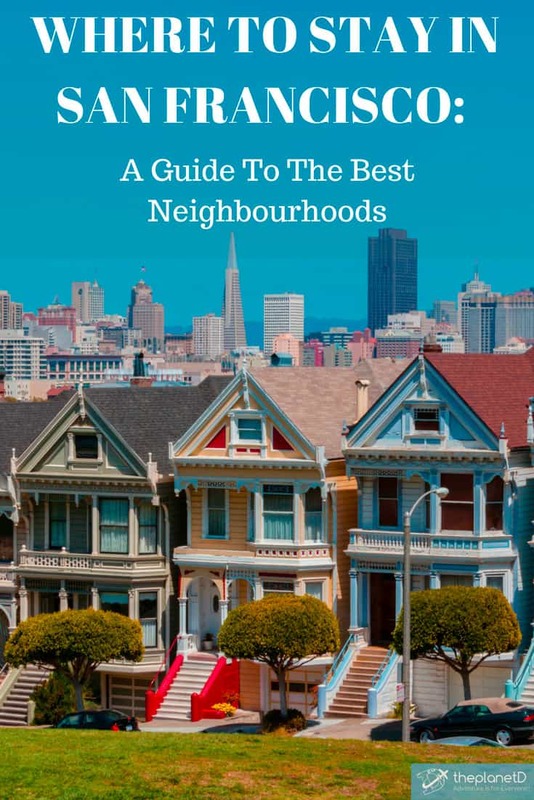 13 Responses to "Where to Stay in San Francisco – A Guide To The Best Neighborhoods and Accommodation"
Such a helpful guide! We loved staying near Union Square but will have to check out one of these neighbourhoods next time! Lombard street is such a cute place to visit and North Beach looks perfect! What an excellent guide! I’m sure a lot of travelers who are planning on a visit to San Francisco will find this very helpful.. I stayed in the financial district last time I was in SF and really liked it. There was so much to see and do. Will have to check out another one of your listed neighborhoods next visit! I’ve heard that San Francisco is a pretty dangerous place to stay in. My husband and I hope to visit SF in Oct 2019, is it safe to do so? Good post and right to the point. I don’t know if this is really the best place to ask but do you people have any thoughts on where to employ some professional writers? Thank you ? Can it get any better than this? I dont think I need to even search elsewhere for any more information. Yep, definitely going to enjoy the trip to San Francisco. Not sure of flowers in my hair though! A Really nice city where I have been living for a while. This summer I am getting back there. Hope to discover it once again. What a great overview of San Francisco! One thing I love about the place is that there are so many ‘off the beaten path’ things to do – you never run out! I like how you laid out the different areas of the city and what they have to offer. The pictures and map are great! The map provided could use some updates. “The Avenues” are more commonly referred to as The Sunset south of Golden Gate Park, and The Richmond District north of the park. The yellow and green sections labeled Golden Gate are The Presidio (green) and The Marina (yellow). Plus, the waterfront south of SoMa (for South Of Market St) has various little sections such as Mission Bay and Dogpatch which are up and coming areas. Listed places to stay at San Francisco with picture helps a lot to find the good accommodation while traveling to this city. thanks for sharing useful tips and tricks. Such a great guide! This is really helpful post. Whenever we go there, used your article. I bookmarked it. Thank you so much for sharing a great information.